This article appeared in the Warsaw (IN) Times-Union on June 15. ICDI is a cooperating organization with the Fellowship of Grace Brethren Churches and was founded and is led by former GBIM missionary Jim Hocking. 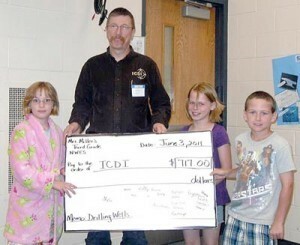 Students from Shellie Miller’s third-grade class at North Webster Elementary School present a check for $717 to Ted Rondeau from Integrated Community Development International of Winona Lake, Pictured (L to R) are: Chloe Beller, Rondeau, Alexis Whitaker and Nathan Bess. Photo provided. NORTH WEBSTER ,IN– Students in Shellie Miller’s third-grade class at North Webster Elementary School decided to help people in Africa after discovering that many people there lack clean water. The class read the book “A Long Walk to Water”, which chronicles the story of Salva Dut, one on the Lost Boys of Sudan from the mid-1980’s. Students found that lack of clean water is a major problem in Africa. Many women and children walk four to eight hours a day to collect water for their families. This water is usually dirty and carries disease. A well that provides clean water can change an entire village. Students held four lemonade stands and sponsored a hat day at school. With these events, students collected $717. This money was donated to Integrated Community Development International in Winona Lake. This money will be used to repair a well in a village in the Central African Republic. Helping repair a well in Africa gave these third-grade students the opportunity to see the world globally and see that they can make a difference outside of their everyday world.